Nice Lake Forest Glen vacation rental, comfortable, clean and newly upgraded. New furniture in the living room (and throughout the unit) to cozy up on in summer or winter. Gas Fireplace adds ambiance during cold nights. Back yard is open to grassy (or in the winter, snowy) common area. The master bedroom features it own bathroom and a king size bed. One guest room has a queen bed and the other has two set of twin bunk beds. Great for a couple or for the whole family! Wifi is available. Located on Lake Tahoe's North Shore, Lake Forest Glen Condominiums are set in a lovely meadow between the highway and the lake. It is an easy walk to Skylandia Park Beach, Bristlecone Beach and many others on the shores of Lake Tahoe. This development features two pools, sauna, hot tub (for year round use), tennis courts, pickleball and a children's play area. Each unit has two reserved parking spots and there is plenty of extra parking in two over flow parking lots located conveniently on the property. 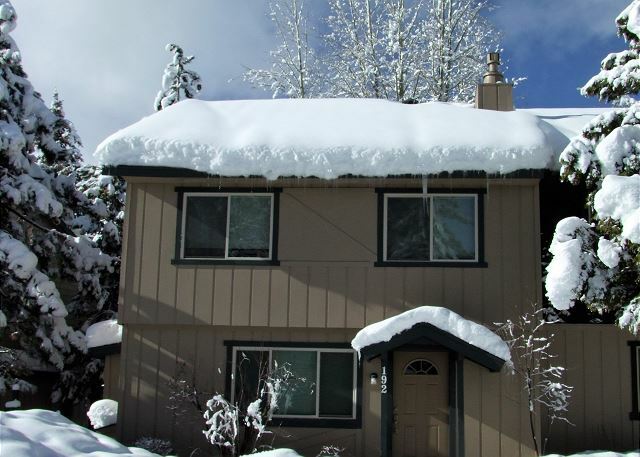 The complex is close to Tahoe City, ski areas including Alpine Meadows, Squaw Valley USA, Northstar and Homewood Mountain, shopping and fine dining. The Coast Guard boat launch is just around the corner for our summer guests. Plus there is convenient access to great biking and walking trails, both on and off road. In the winter, drive up the street to the Tahoe Cross Country XC Center. Easy short drive to Tahoe City with great restaurants, shopping and entertainment.